The DP63000-RTD meter accepts standard RTD inputs and precisely linearizes them into temperature readings. 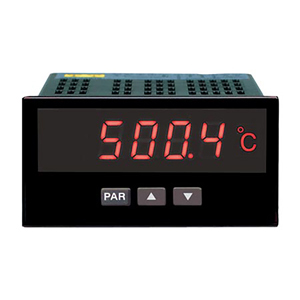 A full 4-digit display accommodates a wide range of temperature inputs. State-of-the-art digital circuitry virtually eliminates errors due to drift. The meter features a readout choice of either Fahrenheit or Celsius with 0.1 or 1° resolution. Display prompts and front panel buttons aid the operator through set-up and operation. Programmable digital filtering enhances the stability of the reading. All set-up data is stored in E2PROM, which will hold data for a minimum of 10 years without power. The meter provides a peak “HI” and valley “LO” reading memory with selectable capture delay time. The capture delay is used to prevent detection of false peak or valley readings that may occur during start-up or unusual process events. The peak and valley readings are stored at power-down, allowing process limits to be monitored over any length of time. The meter has several built-in diagnostic functions to alert operators of any malfunction. Extensive testing of noise interference mechanisms and full burn-in makes the meter extremely reliable in industrial environments. The front bezel meets NEMA 4X (IP65) requirements for wash-down applications.